How Ellen White forbid others from reading fiction all the while she was reading it and incorporating it into her own writings! Did Sister White "put away every novel"? Mrs. White was secretly reading fiction in magazines and making scrapbooks of it for future use, while she was publicly telling the youth to "cease to read the magazines containing stories". Perhaps one of the reasons she did not want the youth reading such magazines is because Mrs. White was incorporating fictional accounts into her "inspired" writings. Where did Ellen White obtain the wonderful "truth for this time"? From heavenly visions? Revelations? Dreams? No, not exactly. She obtained at least some of her "inspiration" from the same fictional writings that she told others to avoid! In 1982, Dr. Fred Veltman, then chairman of the religion department of Pacific Union College, was asked by the Seventh-day Adventist church to analyze the charges of plagiarism brought by Walter Rea and others against Ellen White. Dr. Veltman spent eight years at church expense studying The Desire of Ages. When he finally published his findings in 1990, he announced that one of the 23 sources Ellen White used in writing the book was an "obviously fictional account. "8 More examples of Ellen White's use of fictional material in her writings can be found in Walter Rea's, The Making of a Prophet: How Ellen White turned FICTION into "truth". One can only wonder why she kept these racist works of fiction in her library if fiction was indeed as harmful as she said it was. That is quite an astonishing array of evil caused by one book! Is Uncle Tom's Cabin indeed such a harmful book? Uncle Tom's Cabin is a novel that "depicts the cruel reality of slavery while also asserting that Christian love can overcome something as destructive as enslavement of fellow human beings. "15 The book was partly inspired by the true story of a slave named Josiah Henson. 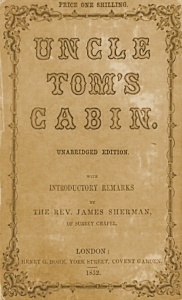 The book, written by a teacher from Connecticut named Harriet Beecher Stowe, helped to fuel the abolitionist movement that eventually led to the end of slavery in the United States. Mrs. Stowe became an icon of freedom in the northern United States, and President Abraham Lincoln met with her prior to the start of the American Civil War. This immensely popular book became the second best-selling book in the world during the 19th century (following only the Bible), with the book being translated into every major human language.16 There is no doubt this book was the most important book written in the 19th century. Does reading Daniel Defoe's Robinson Crusoe--an innocent adventure based upon an incident that actually happened--really destoy a person's interest in the Bible? Is Uncle Tom's Cabin--a book written by a Christian encouraging the end of slavery, with a foreward written by an ordained minister of the gospel--really that terrible? One must wonder, because Mrs. White later clipped stories written by Harriet Stowe and put them into her scrapbooks. Some may find it astonishing that Mrs. White condemned the reading of Uncle Tom's Cabin, an anti-racist book, and yet she kept the racist novels The Clansman and The Leopard's Spots in her own private library. 1. Ellen White, The Youth's Instructor, Oct. 9, 1902. 2. Ellen White, The Youth's Instructor , Feb. 20, 1896. 3. Ellen White, The Youth's Instructor, Aug. 14, 1906. 4. Charles H. Tidwell, Jr., PhD, "Ellen White and Fiction", online article extracted from Andrews University web site on Feb. 20, 2008, http://www.andrews.edu/~tidwell/407egw.htm. For additional reference, see the paper presented by Dr. John O. Waller's (former head of Andrews University English department) at the quadrennial meeting of SDA College English Teachers at La Sierra College, August 1965, entitled �A Contextual Study of Ellen G. White�s Counsel Concerning Fiction,� on file at Andrews University (catalogued in 1970). "While some have argued that this work is not a novel but that it is really an allegory, this misses the point entirely. To be an allegory does not mean that it can not also be a novel or a work of fiction. Literary critics recognize it as such and, in most literary histories, it is pointed to as one of the pivotal early works that helped establish the novel as a major literary form in the eighteenth and subsequent centuries. Pilgrim's Progress has all the characteristics of a novel -- imagined settings, imagined characters who are not true to historical fact, plot, dialogue, conflict, and all the whole parphrenalia that novelists and fiction writers use today as their primary writing techniques." 6. Ellen White, The Ministry of Healing (1905), p. 445. 7. Ellen White, Review and Herald, Jan. 20, 1903. 8. Fred Veltman, Ph.D, Ministry, December 1990. 9. Ellen G. White's Private and Office Libraries File, on file at Loma Linda University, Compiled by: Warren H. Johns, Tim Poirier, and Ron Graybill of the Ellen G. White Estate. 10. Wikipedia, "Thomas Dixon, Jr.", http://en.wikipedia.org/wiki/Thomas_Dixon,_Jr., extracted March 2, 2008. 11. Wikipedia, "The Clansman", http://en.wikipedia.org/wiki/The_Clansman, extracted March 2, 2008. 12. Wikipedia, "The Leopard's Spots", http://en.wikipedia.org/wiki/The_Leopard%27s_Spots, extracted March 2, 2008. 13. Ellen White, Testimonies for the Church Vol. 5, pp. 516-517. 14. Ellen White, Manuscript Releases Vol. 6, p. 257. 15. "Uncle Tom's Cabin", Wikipedia, extracted Feb. 20, 2008. 17. Ellen White, The Ministry of Healing (1905), p. 446.